Grading is often one of the most important aspects of teaching and running an online course. As a teacher or course team member, you might want to know how students are doing on an individual level or look at grade data for the class as a whole. One of the easiest ways to do this is a built-in functionality on Open edX that allows you to download a .csv file of all students' grades. Here's how it's done. This sometimes can be confusing because many people think that anything related to managing the course happens in Studio. This is not so. Grading is considered an Instructor related task, and is therefore built into the LMS side, so teachers don't necessarily have to also be Course Authors. This is a page where you will see many buttons allowing you to download a variety of reports on a wide range of data. You can look at student profile information, certificates issued, reports on responses to a particular problem, and of course, grade reports. Scroll down and click on the button labeled "Generate Grade Report"
NOTE: There are a few features on the Data Download and Student Admin pages that are only available to courses with less than 200 students or so. These are labeled to avoid confusion. 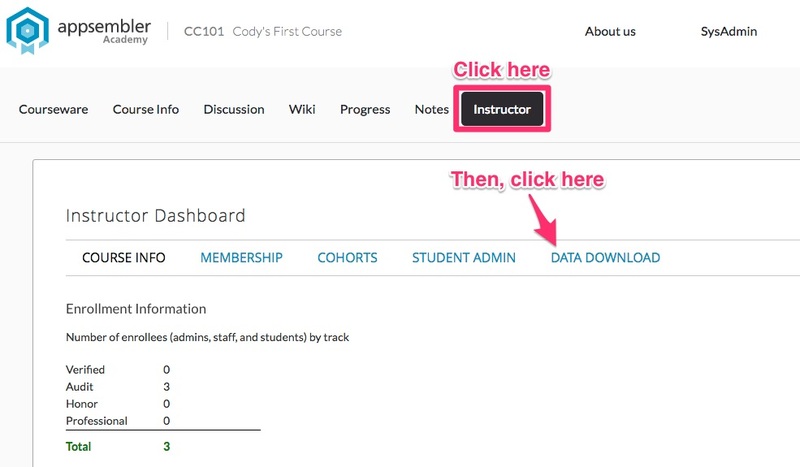 You can generate a csv grade report for any size course. Wait for Open edX to generate the report. This can take anywhere from a few seconds to a several hours depending on the size of your course. NOTE: Do not click the button multiple times. This can slow down the process. These reports are generated in the background, so it's okay to navigate away from the page and do other things while Open edX is working. Once the report is available, scroll to the bottom of the Data Download page and click the file name of the most recent report, which appears at the top of the list. Now open the data in any spreadsheet application of your choosing to see the report. The Grade Report comes with a column for each assignment in the course, and calculates the current grade based off of your grading configuration. For more on how to configure grades and assignment types, check out this article. Each student is sorted into their own row.